The shape of the moon deviates from a simple sphere in ways that scientists have struggled to explain. A new study by researchers at UC Santa Cruz shows that most of the moon's overall shape can be explained by taking into account tidal effects acting early in the moon's history. The results, published July 30 in Nature, provide insights into the moon's early history, its orbital evolution, and its current orientation in the sky, according to lead author Ian Garrick-Bethell, assistant professor of Earth and planetary sciences at UC Santa Cruz. As the moon cooled and solidified more than 4 billion years ago, the sculpting effects of tidal and rotational forces became frozen in place. The idea of a frozen tidal-rotational bulge, known as the "fossil bulge" hypothesis, was first described in 1898. "If you imagine spinning a water balloon, it will start to flatten at the poles and bulge at the equator," Garrick-Bethell explained. "On top of that you have tides due to the gravitational pull of the Earth, and that creates sort of a lemon shape with the long axis of the lemon pointing at the Earth." But this fossil bulge process cannot fully account for the current shape of the moon. In the new paper, Garrick-Bethell and his coauthors incorporated other tidal effects into their analysis. They also took into account the large impact basins that have shaped the moon's topography, and they considered the moon's gravity field together with its topography. 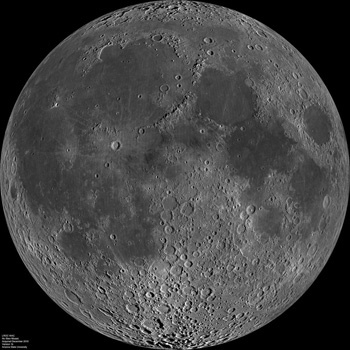 Efforts to analyze the moon's overall shape are complicated by the large basins and craters created by powerful impacts that deformed the lunar crust and ejected large amounts of material. "When we try to analyze the global shape of the moon using spherical harmonics, the craters are like gaps in the data," Garrick-Bethell said. "We did a lot of work to estimate the uncertainties in the analysis that result from those gaps." Their results indicate that variations in the thickness of the moon's crust caused by tidal heating during its formation can account for most of the moon's large-scale topography, while the remainder is consistent with a frozen tidal-rotational bulge that formed later. A previous paper by Garrick-Bethell and some of the same coauthors described the effects of tidal stretching and heating of the moon's crust at a time 4.4 billion years ago when the solid outer crust still floated on an ocean of molten rock. Tidal heating would have caused the crust to be thinner at the poles, while the thickest crust would have formed in the regions in line with the Earth. Published in Science in 2010, the earlier study found that the shape of one area of unusual topography on the moon, the lunar farside highlands, was consistent with the effects of tidal heating during the formation of the crust. "In 2010, we found one area that fits the tidal heating effect, but that study left open the rest of the moon and didn't include the tidal-rotational deformation. In this paper we tried to bring all those considerations together," Garrick-Bethell said. Tidal heating and tidal-rotational deformation had similar effects on the moon's overall shape, giving it a slight lemon shape with a bulge on the side facing the Earth and another bulge on the opposite side. The two processes left distinct signatures, however, in the moon's gravity field. Because the crust is lighter than the underlying mantle, gravity signals reveal variations in the thickness of the crust that were caused by tidal heating. "The moon that faced us a long time ago has shifted, so we're no longer looking at the primordial face of the moon," Garrick-Bethell said. "Changes in the mass distribution shifted the orientation of the moon. The craters removed some mass, and there were also internal changes, probably related to when the moon became volcanically active." The details and timing of these processes are still uncertain. But Garrick-Bethell said the new analysis should help efforts to work out the details of the moon's early history. While the new study shows that tidal effects can account for the overall shape of the moon, tidal processes don't explain the topographical differences between the near side and the far side. In addition to Garrick-Bethell, the coauthors of the paper include Viranga Perera, who worked on the study as a UCSC graduate student and is now at Arizona State University; Francis Nimmo, professor of Earth and planetary sciences at UCSC; and Maria Zuber, a planetary scientist at the Massachusetts Institute of Technology. This work was funded by the Ministry of Education of Korea through the National Research Foundation.